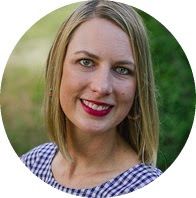 When Sara of Radiant Home Studio contacted me to join her Retro Rucksack tour, I was a bit caught off guard. Me??? I don’t really have a history with sewing bags, but okay. I’m game for just about anything. Remember, I like challenges!?!? Turns out, the trickiest part was deciding on the hardware. (Oh, and sewing the straps on the right side, but who’s counting that.) The pattern calls for two different strap and hardware sizes, but since I opted to use 1 1/2” cotton webbing throughout for my straps, I purchased all 1 1/2” hardware. Sara gives a few suggestions on where to buy the hardware, but I also suggest checking your local hardware store. I came very close to using some cool clips I found at Home Depot. The pattern calls for two exterior fabric options, but I liked the idea of using ticking stripes in two different directions. The back straps really make this bag unique; a bit more on that in a second. 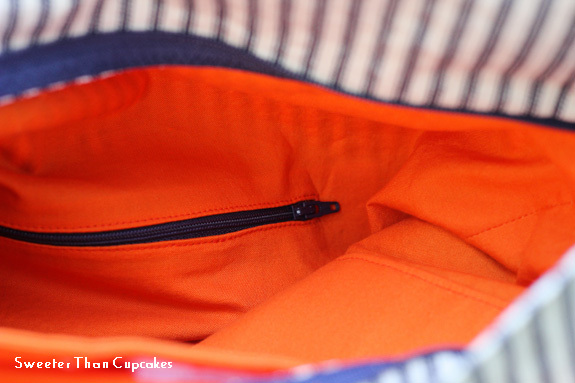 A recessed zipper keeps everything where you want it. 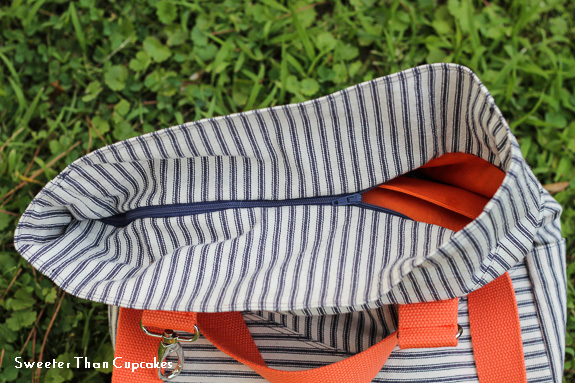 The interior of the bag has a zipper pocket on one side and a large patch pocket on the other side. Back to those unique straps. 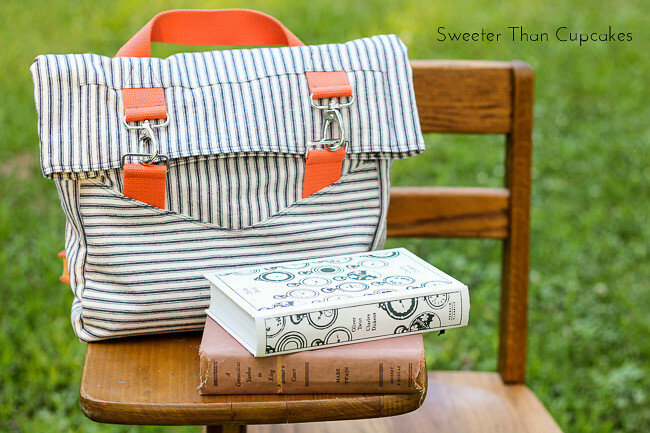 The design gives you two carry options, backpack style or tote. Don’t you love my handsome model?!? I cheated in my photo styling a bit, but it comes together here. 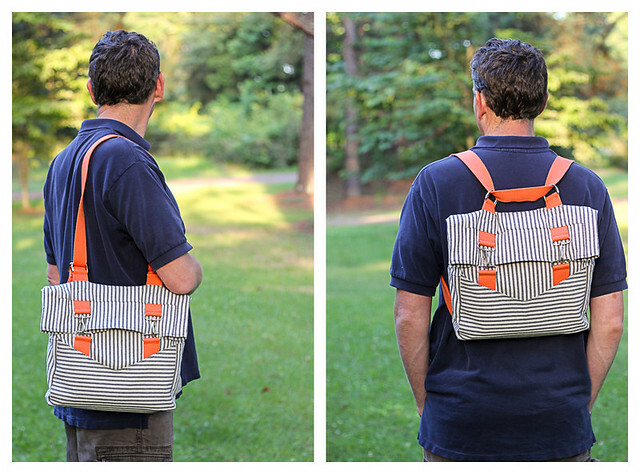 I’ve actually made this for my sister-in-law to use as a diaper bag. She was thrilled with the backpack option since she’s having twins!! From the looks of this, my brother-in-law won’t feel uncomfortable carrying it either. It helps to use a zipper foot when sewing on your hardware. Again, check your local hardware stores for the closures and clips. You might find something out of the box to use! If I sew the pattern again, I will try to find a way to conceal the zipper and fabric edges inside the lining. I zig-zagged the unfinished edge, but it’s not as clean as I would like it. There is more inspiration to come, so follow along the rest of the tour! I can’t wait to see what these talented folks came up with! Wow!!! What a gorgeous bag. The orange really sets it off and I love your straps, great photography too. I'm really looking forward to seeing all the bags on the tour and reading what they thought of the pattern. Thanks Maria!! I had a hard time deciding between orange or yellow. Can't wait to see all of yours also! I love how this turned out! 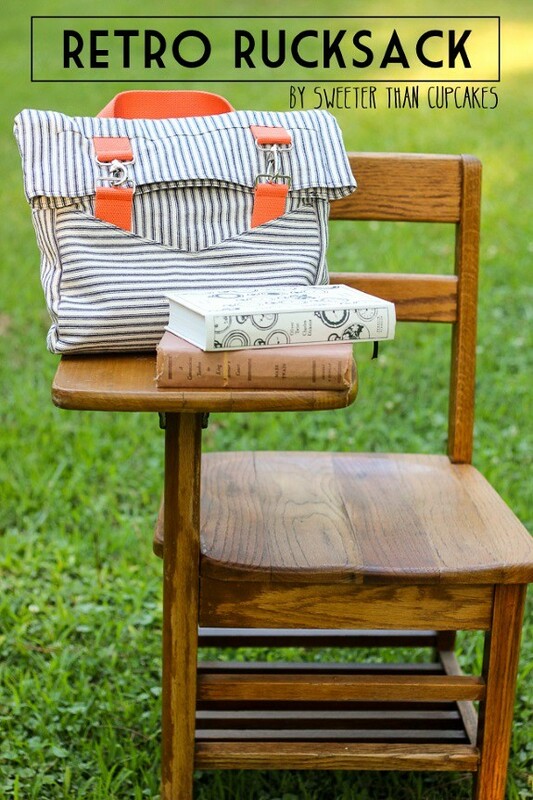 The perpendicular stripes are a great way to use the contrast piece. Excellent modeling of the strap options as well. Thanks for taking on a new challenge...you nailed it! Thanks Sara for including me! My model will thank you also! LOVE IT....especially the color combination, and positioning of the stripes!! 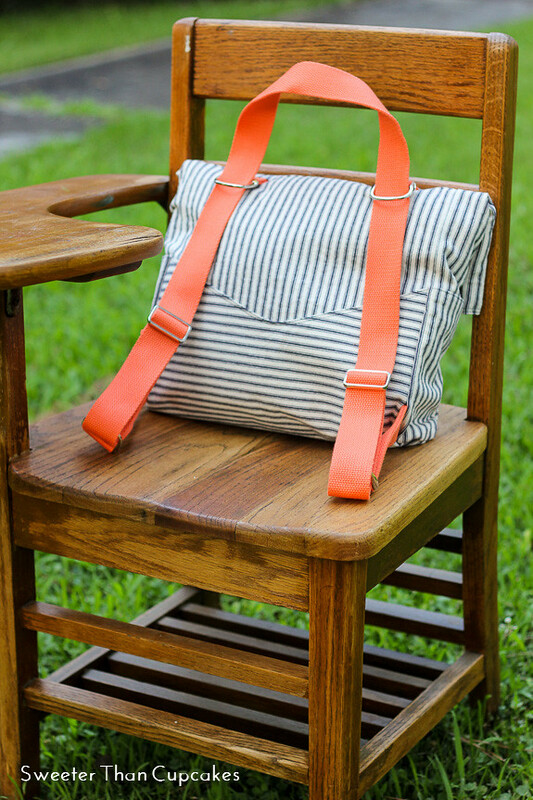 This is going to make an awesome diaper bag! !